While there is no general agreement upon which is the greatest film of all time, many publications and organizations have tried to determine the films considered the best. Each film listed here has topped a notable survey—whether a popular poll or a poll among film reviewers—or is the highest ranked exponent of its genre or country in such a survey. Many of these sources focus on American films or were polls of English-speaking film-goers, but those considered the greatest within their respective countries are also included here. Many films are widely considered among the best ever made, whether they appear at #1 on each list or not. For example, many believe that Orson Welles' Citizen Kane is the best film ever made, and it appears as #1 on AFI's Best Movies list, but it was displaced from the #1 position by Vertigo in the 2012 Sight & Sound decennial critics' poll. Every decade, the British film magazine Sight & Sound asks an international group of film professionals to vote for the greatest film of all time. The Sight & Sound accolade has come to be regarded as one of the most important of the "greatest ever film" lists. The American film critic Roger Ebert described it as "by far the most respected of the countless polls of great movies—the only one most serious movie people take seriously." Bicycle Thieves (1948) by Vittorio De Sica topped the first Sight & Sound critics' poll in 1952. Citizen Kane (1941) by Orson Welles was voted #1 in the five Sight & Sound critics' polls from 1962 to 2002. A separate Sight & Sound poll of established film directors, held for the first time in 1992, also placed Citizen Kane at #1 in 1992 and 2002. Vertigo (1958) by Alfred Hitchcock topped the Sight & Sound critics' poll in 2012, dethroning Citizen Kane. Tokyo Story (1953) by Yasujirō Ozu topped the Sight & Sound directors' poll in 2012, dethroning Citizen Kane. La Règle du jeu (The Rules of the Game) (1939) by Jean Renoir is the only movie to have appeared in every one of the Sight & Sound critics' polls; its only appearance in the directors' poll was #9 in 2002. The Brussels World's Fair, organized in 1958, offered the occasion for the organization by thousands of critics and filmmakers from all over the world, of the first universal film poll in history. Sergei Eisenstein's 1925 film, Battleship Potemkin, was ranked in the top position. In the Rotten Tomatoes aggregate score rankings, The Wizard of Oz (1939) is in 1st place as of 28 November 2016. The Third Man—ranked in 2nd place overall—is the highest ranked film with a 100 percent rating. Metacritic lists over 9,000 films ranked by aggregate score, which sees The Godfather ranked in the top position as of 27 November 2016. The Godfather is one of only three films on the Metacritic list to attain a perfect 100 score, along with Boyhood and Three Colors: Red. In a survey of the Hollywood region undertaken by The Hollywood Reporter in 2014, in which every studio, agency, publicity firm and production house was ballotted, over 2000 industry workers voted The Godfather (1972) the greatest film. Gone with the Wind (1939) was picked as the best film for Best in Film: The Greatest Movies of Our Time. The Godfather (1972) was voted #1 by Entertainment Weekly's readers in 1999 and voted as #1 in a Time Out readers' poll in 1998. The film was also voted as the "Greatest Movie of All Time" in September 2008 by 10,000 readers of Empire magazine, 150 people from the movie business and 50 film critics. Its sequel The Godfather Part II (1974) was voted best movie ever by TV Guide readers in 1998. Star Wars (1977) was chosen as the greatest film by readers of Empire magazine in September 2001, and by voters in a Channel 4 (Film4) poll—together with its sequel The Empire Strikes Back (1980)—in November 2001. The Lord of the Rings trilogy (2001–2003) was voted the most popular film of all time by an audience poll for the Australian television special My Favourite Film and by a poll cast by 120,000 German voters for the TV special "Die besten Filme aller Zeiten" (German "The best films of all time") in 2004. Mad Max 2 (1981), also known as The Road Warrior, was voted the greatest action film of all time in a poll by Rolling Stone magazine in 2015. Raiders of the Lost Ark (1981) was chosen as the best action film for Best in Film: The Greatest Movies of Our Time. Die Hard (1988) was voted the greatest action film of all time by a Time Out poll of fifty experts in the genre, including directors and actors, in 2016. Mad Max: Fury Road (2015) tops Rotten Tomatoes' Top 100 Action & Adventure Movies list with a 97% score based on 356 reviews as of 28 November 2016. The Adventures of Robin Hood (1938) is the highest ranked film (at #4) with a 100 percent rating. My Neighbor Totoro (1988) by Hayao Miyazaki was ranked at #1 in Time Out's list of top 50 greatest animated films in 2009. Beauty and the Beast (1991) is #1 on IGN's "Top 25 Animated Movies of All Time" list in 2010. The Lion King (1994) was chosen as the best animated film for Best in Film: The Greatest Movies of Our Time in 2011. Toy Story (1995) was voted #1 on the "Top 100 Animated Features of All Time" list by the Online Film Critics Society (published March 2003). The original and its sequel hold a perfect 100% score at Rotten Tomatoes as of 28 November 2016. Spirited Away (2001) by Miyazaki is at #10 the highest-ranking animation in Empire magazine's "100 Best Films of World Cinema" list from 2010. Inside Out (2015) tops Rotten Tomatoes' Top 100 Animation Movies list with a 98% score based on 317 reviews as of 28 November 2016. It's a Wonderful Life (1946) is #1 on the Movie Review Query Engine's list of the best holiday movies as of 1 December 2016. It also tops Rotten Tomatoes' Best Christmas Movies list. A Christmas Story (1983) is #1 on IGN's Top Holiday Movies of All Time list from 2015. Die Hard (1988) was voted Empire's "The Greatest Christmas Film of All Time" in 2010. Monty Python's Life of Brian (1979) was voted the greatest comedy ever in polls conducted by Total Film magazine in 2000, the British TV networks Channel 4 in 2006  and Five in 2007, and The Guardian newspaper in 2007. Airplane! (1980) was chosen as the best comedy for Best in Film: The Greatest Movies of Our Time. Ghostbusters (1984) was ranked first by IGN as the best comedy in their list of Top 25 Best Comedies Of All Time in 2012. The Dark Knight (2008) was voted the greatest superhero movie in a reader's poll conducted by Rolling Stone in 2014, was placed #1 on a comic book movie list published by Rotten Tomatoes in 2012, and tops a list on comic book adaptations by Movie Review Query Engine as of 1 December 2016. 12 Angry Men (1957) is the highest-rated courtroom drama on Rotten Tomatoes's Top 100 Movies of All Times at #39 with 100% based on 48 reviews as of 28 November 2016. The main advertisement image for "The Godfather"
The Godfather (1972) was chosen as the greatest crime film out of 25 movies by the IGN website in 2011. Goodfellas (1990) was listed as the greatest film of all time by Total Film in 2005. The Poseidon Adventure (1972) was voted best disaster movie in a poll commissioned by UCI cinemas in May 2004. Man with a Movie Camera (1929) was voted the greatest documentary ever by 200 curators and critics and 100 film makers, many of whom were documentary specialists, in a 2014 poll organised by Sight & Sound. Bowling for Columbine (2002) heads the list of 20 all-time favorite non-fiction films selected by members of the International Documentary Association (IDA) in 2002. Hoop Dreams (1994) was ranked as the greatest documentary of all time by the International Documentary Association in 2007. The Seven Up! series (1964–) was voted as the greatest ever documentary in a Channel 4 poll of the 50 Greatest Documentaries in 2005. See The Wizard of Oz in the Rotten Tomatoes section above. The Breakfast Club (1985) ranked at #1 on Entertainment Weekly's 2006 list of best high school movies. Seven Samurai (1954) was the highest-ranking historical period film in the 1982 Sight & Sound critics' poll. Schindler's List (1993) was chosen as the best political/historical film for Best in Film: The Greatest Movies of Our Time. The Cabinet of Dr. Caligari (1920) is ranked #1 on Rotten Tomatoes' Top 100 Horror Movies list with a 100% score based on 48 reviews as of 28 November 2016. The Exorcist (1973) was chosen as the best horror film for Best in Film: The Greatest Movies of Our Time. The Texas Chain Saw Massacre (1974) ranks #1 on Total Film's 2005 list of the greatest horror films. The Shining (1980) ranks #1 on The Moving Arts Film Journal's 2010 list of the 25 greatest horror films. The Silence of the Lambs (1991) was chosen as the best suspense/thriller for Best in Film: The Greatest Movies of Our Time. West Side Story (1961) was chosen as the best screen musical by readers of The Observer in a 2007 poll. The Sound of Music (1965) was chosen as the best musical for Best in Film: The Greatest Movies of Our Time. Cabaret (1972) was picked as the best musical by critics at The Guardian and The Observer in 2013. The Third Man (1949) is ranked #1 on Rotten Tomatoes' Top 100 Mystery & Suspense Movies list with a 100% score based on 76 reviews as of 28 November 2016. See Star Wars and The Empire Strikes Back in the Films acclaimed in audience polls section above. 2001: A Space Odyssey (1968) tops the Online Film Critics Society 2002 list of greatest science fiction films of all time, and was named the best science fiction film of all time by The Guardian in 2010. It is also the only science fiction film to make the Sight and Sound critics' poll for ten best movies (#10 in 1992, #6 in 2002 and 2012). Blade Runner (1982) was voted the best science fiction film by a panel of scientists assembled by the British newspaper The Guardian in 2004. In New Scientist, Blade Runner was voted "all-time favourite science fiction film" in both the staff, and reader's 2008 polls. Mad Max: Fury Road (2015) is ranked #2 on Rotten Tomatoes' Top 100 Science Fiction & Fantasy Movies list with a 97% score based on 356 reviews as of 28 November 2016, behind fantasy film The Wizard of Oz (1939). Rocky (1976) topped Digital Spy's "greatest ever sports movie" audience poll in 2012. Murderball (2005) is ranked #1 on Rotten Tomatoes' Top 100 Sports & Fitness Movies list with a 98% score based on 138 reviews as of 1 December 2016. See Gone with the Wind, Casablanca and Schindler's List in the Films acclaimed in audience polls section above. Paths of Glory (1957) is #1 on the Movie Review Query Engine's list of the best military movies as of 1 December 2016. The Longest Day (1962) topped the list of the Moviefone 25 Best War Movies in 2007. Apocalypse Now (1979) was picked as the #1 greatest war movie by critics at The Guardian and The Observer in 2013. The Treasure of the Sierra Madre (1948) is ranked #1 on Rotten Tomatoes' Top 100 Western Movies list with a 100% score based on 45 reviews as of 1 December 2016. Butch Cassidy and the Sundance Kid (1969) was chosen as the best western film for Best in Film: The Greatest Movies of Our Time. The Castle (1997) was selected by the public as Australia's favourite film in a 2008 poll conducted by the Australian Film Institute, in collaboration with Australia Post. Titash Ekti Nadir Naam (1973): A River Called Titas topped the list of 10 best Bangladeshi films, as chosen in the audience and critics' polls conducted by the British Film Institute in 2002. Cidade de Deus (City of God; 2002), directed by Fernando Meirelles and Kátia Lund, is at #7 the highest-ranked Brazilian film on Empire magazine's "100 Best Films Of World Cinema" from 2010. Mon oncle Antoine (1971): Named first in the Toronto International Film Festival's Top 10 Canadian Films of All Time in 1984, 1993 and 2004. The Sweet Hereafter (1997): Voted the best Canadian film ever by readers of Playback in 2002. Atanarjuat: The Fast Runner (2001) was named first in the Toronto International Film Festival's 2015 Top 10 Canadian Films of All Time. Marketa Lazarova (1967) was voted the all-time best Czech-Slovak movie in a 1998 poll of 54 Czech and Slovak film critics and publicists. The film was once again voted the all-time best Czech movie in a 2011 poll by the critics. In 2011, the editorial staff of Reflex Magazine chose the film as the best Czech film. Cosy Dens (1999) is the best Czech film according to readers' poll by Reflex magazine in 2011. Julio comienza en julio (1979): Chosen in 1999 as the "Best Chilean Film of the Century" in a vote organized by the Municipality of Santiago. Spring in a Small Town (小城之春) (1948) was ranked #1 on the Hong Kong Film Awards Association's Best 100 Chinese Motion Pictures list in 2005. Farewell My Concubine (霸王别姬; 1993) was picked as #1 by 88 international film experts for Time Out's 100 Best Mainland Chinese Films in 2014. Tko pjeva zlo ne misli (One Who Sings Means No Harm, 1970) was voted the best Croatian movie of all time by Croatian film critics in 1999. Kevade (Spring, 1969) received the first place in the Estonian feature films Top Ten Poll in 2002 held by Estonian film critics and journalists. La Règle du Jeu (The Rules of the Game) (1939). See polls of critics and filmmakers. Der letzte Mann (The Last Laugh) (1924) was ranked #11 on the Brussels World's Fair's international film poll in 1958. A Better Tomorrow (英雄本色) (1986), filmed and produced in Hong Kong, was voted the second best Chinese film ever made by the Hong Kong Film Awards Association in 2005. In the Mood for Love (花樣年華) (2000), directed by Wong Kar-wai, was chosen as the greatest Hong Kong film out of 100 choices by the Hong Kong edition of Time Out. The Round-Up (1965) by Miklós Jancsó was chosen as the best Hungarian film in a 2000 Hungarian film critics' poll. Pather Panchali (1955), the first part of The Apu Trilogy by Satyajit Ray, appeared on the Sight & Sound Critics' Poll in 1992 (ranked #6). It also topped the British Film Institute's user poll of "Top 10 Indian Films" of all time in 2002. Sholay (1975), a "Curry Western" Hindi film directed by Ramesh Sippy, topped the British Film Institute's critics' poll of "Top 10 Indian Films" of all time in 2002. Mayabazar (1957), a Telugu mythological film directed by Kadiri Venkata Reddy, was chosen as the greatest Indian film of all time in an online poll conducted by IBN Live in 2013. Bicycle Thieves (Ladri di biciclette; 1948). See Sight & Sound poll section above. 8½ (1963) by Federico Fellini was at #9 the highest rated Italian film in the 2002 Sight & Sound critics' poll of the best films of all time. Rashomon (羅生門; 1950) by Akira Kurosawa is at #10 the highest-ranked Japanese film on the Village Voice 1999 "Best Films of the Century" list, voted on by 59 film critics. Tokyo Story (東京物語 Tokyo Monogatari; 1953) by Yasujirō Ozu topped the Sight & Sound directors' poll and came third place in the critics' poll in 2012. Seven Samurai (七人の侍 Shichinin no Samurai; 1954) by Akira Kurosawa topped Empire magazine's "The 100 Best Films Of World Cinema" list in 2010. Pan's Labyrinth, a 2006 Spanish-Mexican co-production, is at #5 the highest ranked Mexican film on Empire magazine's 2010 list "100 Best Films Of World Cinema". Zwartboek (Black Book – 2006 – Paul Verhoeven): Voted best Dutch film of all time at the 2008 Netherlands Film Festival by nearly 15,000 members of the public. See Lord of the Rings in the Films acclaimed in audience polls section above. Ni Liv (Nine Lives – 1957 – Arne Skouen): The critics' choice for "Best Norwegian Film of All Time" during the 2005 Bergen International Film Festival. Flåklypa Grand Prix (Pinchcliffe Grand Prix – 1975 – Ivo Caprino): The people's choice for "Best Norwegian Film of All Time" during the 2005 Bergen International Film Festival. Baji (1963), directed by S. Suleman, topped the British Film Institute's critics' poll of "Top 10 Pakistani Films" of all time in 2002. Aina (1977), directed by Nazr-ul-Islam, topped the British Film Institute's user poll of "Top 10 Pakistani Films" of all time in 2002. Himala (Miracle) (1982) by Ishmael Bernal won the 2008 CNN Asia Pacific Screen Awards Viewers Choice as "Best Asia-Pacific Film of All Time" (voted for by thousands of film fans around the world). The Promised Land (1975) was considered as the best Polish movie by the critics of "Esensja" magazine in 2011 ranking. Reconstituirea (The Reenactment, 1968) directed by Lucian Pintilie was selected as the best Romanian film by 40 film critics in 2008. Броненосец Потёмкин (Battleship Potemkin): see Brussels World's Fair's international poll above. Pictures of the Old World (1972) was voted in 2000 by Slovak critics as the best Slovak film of all time. The Shop on Main Street (1965) was named the second best film in the 100 years of Czech-Slovak cinema in a poll of 54 filmmakers, critics, and theorists. It was the best placed Slovak film in this poll. It should be noted that there is a controversy whether the Film is Slovak or Czech. Oldboy (올드보이; 2003) is at #18 the highest ranked Korean film on Empire magazine's 2010 list "100 Best Films Of World Cinema". Pura Handa Kaluwara (1997) by P. Vithanage topped the British Film Institute's critics' poll of "Top 10 Sri Lankan Films" of all time in 2002. Ananta Rathiriya (1995) by P. Vithanage topped the British Film Institute's user poll of "Top 10 Sri Lankan Films" of all time in 2002. Persona (1966) by Ingmar Bergman reached the highest position (#5 in 1972) of any Swedish film on any of Sight & Sound's lists of greatest films of all time. The Phantom Carriage (Körkarlen, 1921) by Victor Sjöström was voted the best Swedish film of all time by 50 film critics and academics in a poll conducted by film magazine FLM in 2012. A City of Sadness (traditional Chinese: 悲情城市, 1989) is at #5 the highest ranking Taiwanese film on a list of the Best 100 Chinese Motion Pictures unveiled by the Hong Kong Film Awards in 2005. Yol (1982) by Şerif Gören was selected as the best Turkish film in a 2003 poll undertaken by Ankara Sinema Derneği (Ankara Association for Cinema Culture) of people interested in cinema professionally. Земля (Earth) (1930) was ranked #10 on the Brussels World's Fair's international film poll in 1958. The Third Man (1949): Voted best British film ever by 1000 industry professionals, academics, and critics in a British Film Institute poll conducted in 1999. Highest ranked British entry and #2 overall on the Rotten Tomatoes list of the best films of all time with a 100% rating based on 76 reviews as of 4 December 2016. Lawrence of Arabia (1962): voted "best British film of all time" in August 2004 by over 200 respondents in a Sunday Telegraph poll of Britain's leading filmmakers. Don't Look Now (1973): Named best British film in a poll of 150 film industry experts conducted by Time Out London in 2011. Citizen Kane (1941) was selected as the greatest American film in 2015 by sixty-two international film critics surveyed by the BBC. It was also ranked top in every Sight & Sound critics' poll between 1962 and 2002, and the directors' poll in 1992 and 2002. 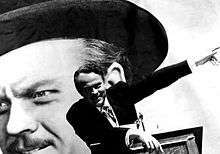 The American Film Institute polled 1,500 film community leaders for the lists 100 Years... 100 Movies and 100 Years... 100 Movies (10th Anniversary Edition) in 1998 and 2007 respectively, both of which identified Citizen Kane as the best American film ever. Casablanca (1942) was voted the greatest film on the American Film Institute's list by readers of the Los Angeles Daily News in 1997. Vertigo (1958) topped the Sight & Sound critics' poll in 2012, dethroning Citizen Kane at the top of the critics' poll for the first time in 50 years since 1962. ↑ "'Citizen Kane' fave film of movie elite". rogerebert.com. Retrieved 2008-01-01. ↑ Jewsiewicki, Władysław (1967). Kronika kinematografii światowej 1895–1964 (in Polish). Warsaw. p. 129. 1 2 3 "Top 100 Movies of All Time". Rotten Tomatoes. ↑ "Best Movies of All Time". Metacritic. Retrieved 2016-11-27. 1 2 "Hollywood's 100 Favorite Films". The Hollywood Reporter. June 25, 2014. Retrieved July 3, 2014. 1 2 3 4 5 6 7 8 9 "Best in Film: The Greatest Movies of Our Time - Entertainment News - ABC News Radio". ABC News Radio. Retrieved 2016-11-30. ↑ "posting about Entertainment Weekly's book". Filmsite.org. Retrieved 2011-08-04. ↑ "posting about Time out reader's poll". Filmsite.org. Retrieved 2011-08-04. ↑ "The 500 Greatest Movies of All Time". Empire. October 3, 2008. Retrieved 2011-08-04. ↑ "50 Greatest Movies From TV Guide (part 1)". 10awesome.com. ↑ "BBC News | FILM | Star Wars' triumph in best movie poll". news.bbc.co.uk. Retrieved 2016-12-02. ↑ "Star Wars voted best film ever". BBC News. 2001-11-26. Retrieved 2010-03-26. ↑ "My Favourite Film – Top 100". Archived from the original on 2011-04-23. ↑ "Er ist der Beste: "Herr der Ringe"-Trilogie vor "Star Wars" und "Forrest Gump" zum "besten Film aller Zeiten" gewählt: Kabel 1 präsentierte Top 20-Spielfilme und internationale Stars" [It is the best: 'Lord of the Rings,' trilogy of 'Star Wars' and 'Forrest Gump' voted 'the best film of all time': Kabel 1 presented top 20 feature films and international stars]. presseportal.de (in German). Retrieved 2011-08-04. ↑ "Readers' Poll: The 10 Best Action Movies of All Time". Rolling Stone. Retrieved 2016-11-30. ↑ "The 100 best action movies ever made". Time Out New York. Retrieved 2016-11-30. ↑ "Top 100 Action & Adventure Movies - Rotten Tomatoes". www.rottentomatoes.com. Retrieved 2016-11-28. ↑ "My neighbor Totoro is #1 by Time Out.". Time Out. Archived from the original on January 23, 2013. Retrieved November 3, 2011. ↑ "OFCS Top 100 Animated Features". ofcs.org. Online Film Critics Society. Retrieved 2016-11-30. 1 2 3 4 5 "The 100 Best Films Of World Cinema". Empire. Retrieved 2016-12-03. ↑ "Top 100 Animation Movies". Rotten Tomatoes. Retrieved October 4, 2016. ↑ "25 Best Holiday Movies". 25 Best Holiday Movies – MRQE – the Movie Review Query Engine. Retrieved 2016-12-01. ↑ "Rotten Tomatoes' Best Christmas Movies". Rotten Tomatoes. Retrieved 2015-07-31. ↑ "Top 25 Holiday Movies of All-Time". IGN. Retrieved 2011-03-20. ↑ "The 30 Best Christmas Movies Ever". Empire. Retrieved 2016-08-08. ↑ "Life of Brian tops comedy poll". BBC News. September 29, 2000. Retrieved 2007-04-03. ↑ "Life of Brian named best comedy". BBC News. 2006-01-01. Retrieved 2010-05-02. ↑ French, Philip (2007-07-22). "The last laugh: your favourite 50". The Guardian. London. Retrieved 2010-05-02. ↑ "Top 25 Comedies of All Time". IGN. 2012-03-13. Archived from the original on 2012-08-27. Retrieved 2016-12-01. ↑ "Readers' Poll: The 15 Greatest Superhero Movies". Rolling Stone. Retrieved June 13, 2014. ↑ "Best Comix Countdown 2012". Rotten Tomatoes. Retrieved August 17, 2012. ↑ "MRQE's Best of Comics & Superheroes". Mrqe.com. Retrieved 2011-08-04. ↑ "Top 25 Crime Movies". IGN. 2011-05-16. Retrieved 2016-12-01. ↑ "Goodfellas named "greatest movie"". BBC NEWS. October 25, 2005. ↑ "Poseidon Adventure tops film poll". BBC News. 2004-05-17. Retrieved 2011-08-04. ↑ "Critics' 50 Greatest Documentaries of All Time". BFI. Retrieved 2015-02-27. ↑ ""Bowling for Columbine" Named Best Documentary Film". About.com. December 12, 2002. Retrieved 2009-09-18. ↑ "IDA's Top 25 Documentaries". International Documentary Association. Retrieved 2016-11-28. ↑ Dirks, Tim. "Top Films of All-Time, Part 2", Filmsite, 2010. ↑ "50 Best High School Movies". Film Site. Retrieved 2011-12-25. ↑ "Top 100 Horror Movies - Rotten Tomatoes". www.rottentomatoes.com. Retrieved 2016-11-28. ↑ "Texas Massacre tops horror poll". BBC News. 2005-10-09. Retrieved 22 November 2009. ↑ "TMA's 25 Greatest Horror Movies of All Time". The Moving Arts Film Journal. 2010-08-25. Retrieved 4 August 2010. ↑ "West Side Story Tops Best Movie Musical". Starpulse.com. 2007-02-19. Archived from the original on 2007-02-22. Retrieved 2011-08-04. ↑ "Top 10 musicals". The Guardian. 3 December 2013. Retrieved 5 December 2015. ↑ "Top 100 Mystery & Suspense Movies - Rotten Tomatoes". www.rottentomatoes.com. Retrieved 2016-11-28. ↑ "2001: A Space Odyssey Named the Greatest Sci-Fi Film of All Time By the Online Film Critics Society". Online Film Critics Society. Retrieved 2006-12-15. ↑ Catherine Shoard (21 October 2010). "C2001: A Space Odyssey: the best sci-fi and fantasy film of all time". The Guardian. Retrieved 2014-07-14. ↑ Alok Jha, science correspondent (2004-08-26). "Scientists vote Blade Runner best sci-fi film of all time". Guardian. Retrieved 2011-08-04. ↑ George, Alison (1 October 2008). "New Scientist's favourite sci-fi film". New Scientist. Reed Business Information. Retrieved 2008-11-28. ↑ George, Alison (12 November 2008). "Sci-fi special: Your all-time favourite science fiction". New Scientist. Reed Business Information (2682). ↑ "Top 100 Science Fiction & Fantasy Movies - Rotten Tomatoes". www.rottentomatoes.com. Retrieved 2016-11-28. ↑ "'Rocky' voted greatest ever sports movie by Digital Spy readers". Digital Spy. 27 July 2012. Retrieved 26 August 2012. ↑ "Top 100 Sports & Fitness Movies - Rotten Tomatoes". www.rottentomatoes.com. Retrieved 2016-12-01. ↑ "MRQE's Best Military Movies". Mrqe.com. 1993-10-03. Retrieved 2011-08-04. ↑ "25 Best War Movies". Moviefone. AOL. Archived from the original on 2010-10-05. Retrieved June 2, 2011. ↑ "Top 10 war movies". The Guardian. Guardian Media Group. October 23, 2013. Retrieved November 1, 2013. ↑ "Top 100 Western Movies - Rotten Tomatoes". www.rottentomatoes.com. Retrieved 2016-12-01. ↑ "Australia's Favourite Film". Australian Film Institute. Archived from the original on 2011-03-07. Retrieved 2014-07-15. ↑ "Top 10 Bangladeshi Films". British Film Institute. Archived from the original on May 27, 2007. Retrieved 8 June 2014. ↑ "Top 10 Canadian Films of All Time". The Canadian Encyclopedia. Retrieved 17 March 2013. ↑ "Egoyan tops Canada's all-time best movies list". Playback. 2 September 2002. Retrieved 2 August 2016. ↑ Steve Gravestock, "Essay," TIFF.net, URL accessed 24 April 2015. 1 2 "Top 10 Cesko-Slovenskeho Hraneho Filmu". Mestska kina Uherske Hradiste (in Czech). 1998. Archived from the original on 2 October 1999. 1 2 "10 nejlepších českých filmů podle čtenářů Reflexu. Nejraději máte Pelíšky!". Reflex.cz (in Czech). Retrieved 28 November 2016. ↑ "Memoria Chilena – Presentación". Memoriachilena.cl. Retrieved 2013-09-29. 1 2 3 "Welcome to the Hong Kong Film Awards" (in Chinese). 2004. Retrieved 2007-04-04. ↑ "The 100 best Mainland Chinese Films: the full list". TimeOut Beijing. 4 April 2014. ↑ ""Tko pjeva, zlo ne misli" najbolji hrvatski film svih vremena!". Slobodna Dalmacija (in Croatian). 1999-11-28. Retrieved 2013-02-08. ↑ "Tallinnfilm" (in Estonian). Tallinnfilm.ee. Archived from the original on 2008-03-24. Retrieved 2011-08-04. ↑ Jyrki Räikkä Kirjoittaja on kulttuuritoimittaja. (2007-05-28). "Tuntematon sotilas on lukijoiden mielestä yhä paras – HS.fi – Kulttuuri" (in Finnish). HS.fi. Archived from the original on 2007-05-31. Retrieved 2011-08-04. ↑ Edmund Lee (14 Mar 2012). "The 100 Greatest Hong Kong Films". Time Out. Retrieved July 15, 2014. ↑ "Budapesti 12" (in Hungarian). Sulinet.hu. Retrieved 2011-08-04. ↑ "User Poll: Indian Top 10". British Film Institute. 2002. Archived from the original on 2008-05-30. ↑ "Top 10 Indian Films". British Film Institute. 2002. Archived from the original on 2011-05-15. Retrieved 2009-03-14. ↑ "'Mayabazar' is India's greatest film ever: IBNLive poll". Ibnlive.in.com. Retrieved 2013-09-29. ↑ "And The Winner Is..." (PDF). TheCommitments.net (Press release). July 14, 2005. Archived from the original (PDF) on December 19, 2005. Retrieved October 27, 2016. ↑ "העם בחר סרג'יו" [The people elected Sergio]. Ynet.co.il (in Hebrew). 1995-06-20. Retrieved 2011-08-04. ↑ "פרויקט הסרטים הגדול: חמשת הגדולים" [Great films project: the Big Five]. NRG Ma'ariv (in Hebrew). April 15, 2013. Retrieved October 27, 2016. ↑ "הסרט הדברות: פרויקט הסרטים הישראלים הגדול" [Movie dialogue: the great Israeli film project]. NRG Ma'ariv (in Hebrew). Retrieved October 27, 2016. ↑ "Take One: The First Annual Village Voice Film Critics' Poll". The Village Voice. 1999. Archived from the original on 2007-08-26. Retrieved 2006-07-27. ↑ "Zwartboek beste film aller tijden". VPRO (in Dutch). Archived from the original on 2011-09-29. Retrieved 2016-12-04. 1 2 "Norsk film i 100". 2005-10-23. Archived from the original on February 18, 2006. ↑ "Top 10 Pakistani Films". British Film Institute. 2002. Archived from the original on 2008-10-12. Retrieved 2009-03-14. ↑ "User Poll: Pakistani Top 10". British Film Institute. 2002. Archived from the original on 2008-10-11. Retrieved 2009-03-15. ↑ "Asia Pacific Screen Awards Winners Announced". ebroadcast.com.au. November 12, 2008. Archived from the original on December 5, 2008. ↑ "50 najlepszych polskich filmów wszech czasów: 10. Dreszcze (1981, reż. Wojciech Marczewski)" [The 50 best Polish films of all time: #10. Chills (1981, dir. Wojciech Marczewski)]. Stopklatka.pl (in Polish). Retrieved 2014-05-17. ↑ "50. najlepszych polskich filmów wszech czasów" [The 50 best Polish films of all time] (in Polish). Stopklatka.pl. Retrieved 2014-05-17. ↑ "Cele mai bune 10 filme romanesti (?!)" (in Romanian). Dob.ro. Archived from the original on 2012-01-18. Retrieved 2011-08-04. ↑ "Czech and Slovak Film Festival". Pictures of the Old World. Archived from the original on 2016-02-08. Retrieved 4 February 2016. ↑ Horton, Andrew James. "Just Who Owns the Shop? Identity and Nationality in Obchod na korze". SenseOfCinema.com. Retrieved 1 June 2015. ↑ "Top 10 Sri Lankan Films". British Film Institute. 2002. Archived from the original on 2007-11-20. Retrieved 2009-03-14. ↑ "User Poll: Sri Lankan Top 10". British Film Institute. 2002. Archived from the original on 2008-11-20. Retrieved 2009-03-15. ↑ "De 25 bästa svenska filmerna genom tiderna" (in Swedish). 30 August 2012. Retrieved 2 May 2014. ↑ "'En İyi On Türk Filmi' belirlendi" (in Turkish). Arsiv.ntvmsnbc.com. Retrieved 2011-08-04. ↑ "The BFI 100". British Film Institute. Archived from the original on 2008-07-01. ↑ Hastings, Chris; Govan, Fiona (2004-08-15). "Stars vote Lawrence of Arabia the best British film of all time". The Daily Telegraph. London. Retrieved 2010-05-02. ↑ "Get Carter tops British film poll". BBC News. 2004-10-03. Retrieved 2010-05-02. ↑ Calhoun, Dave; Tom Huddleston, David Jenkins, Derek Adams, Geoff Andrew, Adam Lee Davies, Gareth Evans, Paul Fairclough and Wally Hammond. "The 100 best British films", Time Out London, March 2011. ↑ Corso, Regina A. (2008-02-21). "Frankly My Dear, The Force is With Them as Gone With the Wind and Star Wars are the Top Two All Time Favorite Movies" (PDF). Harris Interactive. Archived from the original (PDF) on 2013-06-14. Retrieved 2014-07-13. ↑ Shannon-Missal, Larry (2014-12-17). "Gone but Not Forgotten: Gone with the Wind is Still America's Favorite Movie". Harris Interactive. Archived from the original on 2014-12-28. Retrieved 2015-02-13. ↑ "The 100 greatest American films". BBC. 20 July 2015. Retrieved 23 August 2016. ↑ "AFI's 100 Years...100 Movies". www.afi.com. Retrieved 2016-12-04. ↑ "AFI's 100 Years...100 Movies - 10th Anniversary Edition". www.afi.com. Retrieved 2016-12-04. ↑ "Los Angeles Daily News film poll (1997)". Filmsite.org. 1997-12-03. Retrieved 2011-08-04.